The age of digital comics is upon us, now further expanded by the PlayStation Network digital comics store. The PlayStation Network digital comics store was teased with a free comic offer a month ago, but has now launched and is in full swing. 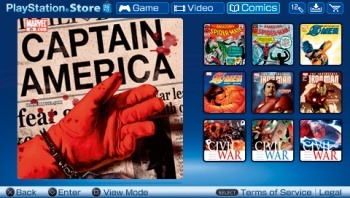 Comics purchased on the store can as of yet only be viewed on a PSP, as long as it has firmware 6.20 installed along with the PSP's digital comics reader. The initial offerings up on the PlayStation Network are pretty decent, with some true gems amongst the crowd. Joss Whedon's entire 24 issue run of Astonishing X-Men is well worth dropping some bones on, and at $1.99 an issue the digital versions end up being cheaper than the trade paperback collections' retail prices (though maybe not their discount Amazon.com prices). $1.99 seems to be the average price of all the available digital comics, thankfully lower than the price of most physical comics that often come in at $2.99 to $3.99. Reading comics on the PSP is easy, and with the digital reader's semi-cinematic "AutoFlow" feature and added sound effects it can feel like watching a motion comic. I read comics mostly for the stories, not necessarily to collect, so I can see purchasing certain series through a digital comics store if it will save me a little money. I still feel like $1.99 might be a little too much to make me a regular customer and in the future I would like to see some kind of subscription model or a discounted collection price.